Creamy Pasta Verde with Garlic Brown Butter Breadcrumbs. I just can’t get enough of these stupid breadcrumbs. I know, I know, I’ve been putting them on everything. I’ll stop. Maybe. Eventually. Sooooo. Sometimes I feel like you just… get me. That we are kindred spirits, if you will. That we row the same boat. Climbs the same trees. Wonder when flared jeans will come back in style and we can do away with this skinny leg crap. Dream of the same bacon topped cupcake. Have Ides of March on repeat because it’s double stocked with the best and most perfect eye candy in the world. You know, I just think we do a lot of the same things that are very important in life and pertinent to our survival. Which makes me think that you probably bought a ton of green stuff – like fresh or frozen vegetables – a week or so ago because it’s January and well, you’re going to eat healthy green things this year! and they are currently dying in your fridge. In your crisper drawer they sit. Wilting away and hoping for a better life while you make your way through pizzas and quesadillas and even apples. But no green things. That stuff’s for the birds. Never mind. Lies. All lies. That is exactly why I’m doing this. I ended up with more green vegetables in my fridge this week than ever before, but let me just preface this with a disclaimer stating that the broccoli was only gracing my fridge due to some recipe development for another project. I would never bring such a blasphemous item into my world. It should simply be happy I didn’t pitch it straight in to the trash. No, really though, I can’t do broccoli. There are a few instances and when I say “a few,” I mean any instance that includes deep frying and tons of melted cheese. And even that’s a stretch. But the thing is… since we are soul sisters (siblings?) and all… I know that some of you feel the same. So I’ve been trying this thing. It’s a thing where I force myself to eat vegetables even though I still can’t stand them. Sometimes I have to take measures such as breath-holding and diet Coke-chasing, but it’s been a little game I’ve been playing with myself for close to a year. And I still hate it. And it totally goes against my resolution to eat All The Delicious Things, but it also sort of goes WITH my resolution to eat All The Delicious Things because if I eat some green stuff, then I have even more leeway to eat additional delicious things. Whatever those are. And to clarify, I’m talking like, maybe three florets of broccoli or something. None of this entire bowl business. Anyhoo. This is one of the ways I’ve been forcing myself to eat the green stuff. It’s much more palatable than, well, anything else, considering it contains a gigantic amount of cheeses and again – those stupid breadcrumbs. Which are just so, so stupid. Begin by bringing a large pot of water to a boil and preparing the pasta according to directions. While waiting for the water to boil, start on the rest of the dish. Keep in mind that you want to reseve about 2/3 of a cup of water from the pasta. Heat a large skillet over medium heat. Add 1.5 tablespoons of olive oil, then toss the chopped broccoli and asparagus in the skillet with 1/4 teaspoon each of salt and pepper. Toss well to coat, then cook until slightly golden and crisp, about 6-8 minutes. Using a large slotted spoon, remove the broccoli and asparagus, setting it aside in a bowl. Add the remaining olive oil to the skillet and reduce the heat to medium-low. Add in the leeks and red pepper, stirring well to coat and cooking until soft, about 5 minutes. Stir in the garlic and cook for 30 seconds, then add spinach and kale with remaining salt and pepper, tossing well. Cook and stir until wilted, about 5 minutes or so. While the kale and spinach are cooking, add butter to a small saucepan over medium heat and whisk constantly while it bubbles. The minute brown bits begin to form on the bottom of the pan, remove from heat and whisk for an additional 30 seconds. (for more step by step photos of browning butter, click here) Let butter stand for 2 minutes, then add in minced garlic and whisk. Add in panko and stir well to coat and combine. Set aside. Slice avocado in half. Remove the flesh from one side, mashing until almost smooth. Add the 2/3 of reserved pasta water to the skillet with the spinach/kale mixture, stirring well. Add the mascarpone cheese and mashed avocado, continuing to stir until totally melted and creamy. Add in the cooked pasta, tossing well to coat. Finish by adding in the cheese, broccoli, asparagus and edamame. Taste and season additionally if desired. To serve, slice remaining avocado and add it to the top of each dish, then cover in garlic brown butter bread crumbs. 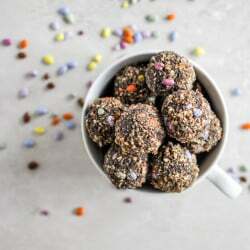 No-Bake Double Chocolate Peanut Butter Snack Bites. So, these would still be totally tasty without all the, you know, veggies, right? Or maybe I should just eat spoonfuls of bread crumbs for dinner? I’d be totally okay with that. I’ve been on a salad fever lately and I just can’t get enough of all the crunchiness inside a big bowl of mixed fresh leaves. That is a lot of green stuff! Way to go, girl! I can eat everything but the asparagus. It is just tooooo green tasting. Sort of like a modern pasta primavera. Good then. Better now. Thanks! Where do you get your avocados? They always look so nice and ripe. I can’t find many good options here in the burgh! There’s a veggie-eater hidden somewhere inside you, I’ll claim. Keep teasing him. I’m okay with being your soul sister. Just don’t tell Dan, he’ll make fun of me. This looks awesome! So healthy and delish! Amazing, just amazing. I want this so badly!! You are a food genius! You need to make a cookbook, I would buy it in a second! I made this for dinner today and it was FANTASTIC. I felt like I was eating at a fine restaurant. Thanks so much for the recipe! I just…feel like broccoli is brushing my mouth when I eat it. Made this for dinner last night. 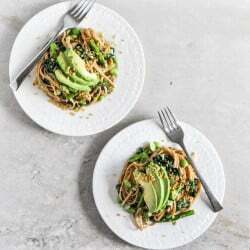 My modifications: added green peas to complete the green veggie theme, used goat cheese instead of the two cheeses you recommended, and used brown rice spaghetti pasta instead of whole wheat. Thanks for the vibrant green dish on a dreary Winter day! I bet this dish will be even more awesome during the Spring. When i cook broccoli pasta, i chop up the broccoli reeaaaaal small and toss it in at the same time as the pasta, to cook with the pasta. When it comes out, its mushy like pesto. Its yum! So I totally made this for dinner last night and it was OH MY GOD to die for. I used haricots verts, zucchini, and mushrooms instead of the veggies you suggested (because that was what was dying in my refrigerator) and it was positively SMASHING. Also: I ONLY BURNED THE BUTTER… Twice. haha! Got it on the third go, though! OMG! This is sooo good. I just made it for dinner and I love it. I used summer squash instead of the asparagus and broccoli. This was my first time using leeks and I don’t even usually like pasta. I will definitely make this one again! Thank you. Pingback: SUNDAY - De quelle planète es-tu? This is my favorite pasta dish in the world. It’s so awesome!